I&apos;ve been patiently waiting for this, and I knew it was just be a matter of time before some of the bastions of the bluewater sailing world would enter our niche with true passagemaking motorboats. It has already happened as one-offs from custom builders, but the production and semi-custom offshore sailboat builders have been a bit more hesitant coming over to the dark side. Hinckley, Valiant, Shannon, Swan and Oyster are just some of the names that represent the highest-quality offshore yachts capable of going anywhere in safety and comfort. I&apos;ve always thought that if they built a passagemaking ocean motorboat, the world would listen. So I was excited when I learned Shannon Yachts was motoring our way, as I&apos;ve long been impressed by its boats. Heavy-duty, rugged, impressive and competent are terms that I&apos;d use to describe Shannon yachts of all sizes. But I was not expecting the surprise that awaited me as I got into a discussion about this project and made my subsequent visit to the Shannon yard in Bristol, Rhode Island. The story of the new Shannon motorboat is one of creative design with futuristic vision. At first, the Shannon 38 SRD seems to be another variation of the express-style cruiser theme, not really relevant to our cruising under power lifestyle. 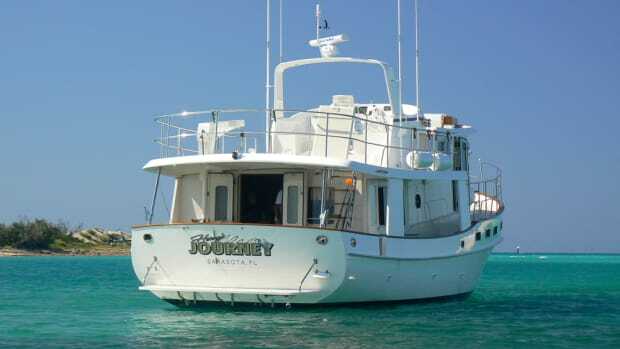 Perfectly able to offer cruising for short duration, the boat didn&apos;t really hit me as a long-distance, liveaboard boat to explore French Polynesia on its own bottom. But I was in for a surprise-and a history lesson. Walter Schulz is the man behind Shannon Yachts, and he&apos;s been building quality yachts since 1975. He is a bearded Irishman whose two grandmothers were born in the lands around the magical Shannon River in Ireland, hence the origin of the company brand. When the first Shannon 38 made its debut at the Annapolis Sailboat show in 1975, Walt took five orders, and the company was on its way. In the 30 years since, Shannon Yachts has launched 335 boats, sail and power, and the company has earned an esteemed position among the ranks of top-quality yacht builders. Throughout this period, Schulz always wanted to build long-range, offshore motorboats capable of crossing oceans; one strictly as a powerboat, another as a motorsailer. But he sensed an uphill battle on both fronts and chose to keep both projects in the background until it was time. He feels current types of powerboat hull shapes require too many compromises, which would hold him back. The one-mile-per-gallon threshold of the typical deep-V hull is grossly inefficient in his mind, although its inherent hydrodynamic lift does provide stability under way. 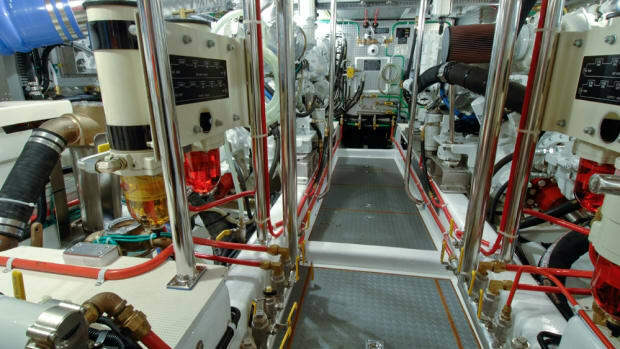 He is also convinced that full displacement powerboats roll too much in certain sea conditions, forcing owners to install stabilizer systems to allow for crew comfort. But Walt feels such equipment is overly complicated, not totally reliable, and, in the case of flopperstopper paravanes, even dangerous. Semi-displacement yachts have flat sections aft to reduce roll but can be horribly snappy, and they too often come equipped with stabilizers. Power catamarans achieve stability under way by having the two hulls some distance apart, but Schulz thinks the hull form has other issues, notably the pounding and crew-bashing when the seas pick up. It is not for him. Schulz is a keen fan of the motorsailer concept, especially the variation developed in the 1920s by William Hand, who lived in nearby Fairhaven, Rhode Island. Hand grew up during a time when the Gloucester-style sailboats were being repowered with developing gasoline engine technology. The commercial fishing boat hulls were very efficient and seaworthy, so even the low horsepower of early engine technology proved a huge improvement over sail power. Seeing firsthand the benefits of motorboats with sailboat-shaped hulls, William Hand went on to become became a preeminent designer of motorsailer yachts, drawing and building displacement powerboats that were both fuel efficient and seaworthy, and that used a reduced sail plan for stability, not propulsion. His evolution of work in the 1920s and 1930s show generous displacement and moderate freeboard and proved great sea boats in all conditions. Coincidentally, Robert Beebe, very much like William Hand, also designed motorboats with sailboat-like hull shapes. Beebe and Hand went down the same road, but they came from very different reference points: Hand at the turn of the century, Beebe after WWII. While William Hand stabilized a boat with sails and Beebe used paravane systems, both used slippery, efficient sailboat hull shapes. Walt Schulz knows the limitations of the general motorsailer, notably the lack of livability on all but the largest yachts. Relatively spartan accommodations in a slender hull are a difficult sell compared to beamy trawler yachts, and the buying public hasn&apos;t chosen to accept that limitation. Today&apos;s couples want their comfort systems, washer/dryer, additional staterooms for guests and lots of space for stuff. Also working against the motorsailer concept are decades of negative opinions that motorsailers are not really very good at anything, although the success of William Hand&apos;s boats would seem to indicate otherwise. I&apos;m certain that Shannon Yachts could build one terrific motorsailer, with reduced sail plan and ballast for stability, following Hand&apos;s lead, and it so happens that the company went ahead and designed one. But the Rhode Island builder has yet to sell such a yacht, and concludes the market just isn&apos;t there for a motorsailing cruising boat. So Walt Schulz has focused on a strict powerboat passagemaker. When I spoke at length with Walt Schulz on the subject of hull shapes, it was clear that he does not accept the aforementioned compromises of powerboat hull forms as appropriate solutions when one considers a passagemaker capable of circumnavigating. And he insists today&apos;s boats are way too complicated. "I&apos;m up the food chain when it comes to fixing mechanical things," Walt told me, "but today&apos;s boats are too much for me. They need to be less complicated. Some of them are downright frightening." And he couldn&apos;t find a hull shape that pleased him in any case. "Basing such a powerboat on a fishing boat makes no sense," Walter explained. "A fishing boat or lobsterboat is designed to run out light, get to the grounds quickly, then run back heavy with its catch. The major benefit of the lobsterboat shape is that weight is infinitely adjustable. It works great, but such dual personality is lost on its use as a yacht. A yacht is always running light. Not to mention, the boat&apos;s motion in a seaway can be lively in sloppy seas, to say the least." Nor is he too keen on the hard-chine, squared-off, semi-displacement powerboat hulls that first made the pleasure-boats scene in the 1960s and that are common today. Not for passagemaking, at least. "If someone were to tell me that I&apos;d be in the 21st century and everyone in this business would be marketing hull shapes from the 1960s, I&apos;d laugh in their faces. Everything else in the world has moved forward, even the materials we use. But boat design hasn&apos;t changed at all. Underwater, nothing has changed from 1960 to 2004...nothing." Walt has experience on power cats and thinks they are a much better idea than a sailing cat. It&apos;s a step forward to him, but they, too, have issues, especially when pounding offshore. And Schulz knows all about pounding offshore, as he makes it a point of spending at least 1,000 miles offshore every year to stay grounded in reality. Several years ago, one of Shannon&apos;s sailboat owners asked the company to build a smaller, second sailboat for sailing shallow Florida waters, and the Shoalsailer 32 was the result. The sailboat draws just 30 inches yet offers great windward sailing ability through a clever hull shape that provides stability through its beam and accelerates laminar flow of water that speeds past the leeward side of the hull and keel. The success of this shoal draft hull shape led to some interesting subsequent CAD exercises on the computer to see how far it could be taken, perhaps as a motorboat. The effort developed into the Shannon 38 SRD, initially intended to be the powerboat version of this successful shoal draft sailboat. It would be a beachable cruiser. But the first 38-footer proved to be much more than just another shallow-draft runabout. Indeed, the results of early sea trials of the new Shannon 38 SRD went off the charts, beyond everyone&apos;s expectations. The boat has unbelievable fuel efficiency and outstanding stability at speed. The builder has since become intrigued that this shape might work in a larger vessel intended for much more than beach parties. In fact, Walt Schulz now wonders if perhaps he is finally working on the holy grail of his career-a long-range passagemaker able to go around the world safely, efficiently, comfortably and with less complexity. SRD stands for Schulz Reverse Deadrise, the design for which is patent pending. I think it best to explain it by walking around the cradled Hull Number 3, under construction at the Shannon yard. The bow has a hollow entry that draws out into fuller sailboat sections. About 60 percent aft of the bow, the hull shape has a slight hollow formed into each side of the hull to create turbulence, much like vortex generators on aircraft wings. The hollow sections work to keep water from separating from the hull, increasing the laminar flow of water against the hull as long as possible. What happens under way is that the slippery, round section of the forward hull does not push water outward as would a traditional powerboat hull, and the hollow midsections keep the water moving along the hull farther aft (again, rather than outward), where it is pushed under the stern, whose concave shape creates enormous lift. The result is amazing efficiency and stability, opening the door to a major breakthrough in boat design. Ideally, a yacht with such a hull requires less horsepower to reach cruising speed, burns less fuel and attains stability through hydrodynamic lift. The first 38 SRD has twin 150hp diesels and has a maximum speed of 25 knots. A traditional deep-V boat would need twice that horsepower to get such speed potential. More importantly to those working on this project, however, is that slowing down to 18 knots, the 38 SRD travels 2 miles per gallon, about half the fuel burn of the "normal" deep-V hull shape. To Walt Schulz, the target is not top speed, but rather, efficiency. If he can build a boat that cruises at 12 knots with half of the traditional horsepower, the fuel burn goes down as well, allowing for longer range with a given amount of fuel. And a stable ride is achieved through hull shape, not complicated or dangerous roll-reducing gear. It is this hull shape that Shannon Yachts now offers in a 53-foot passagemaker, taking that first step in the future of long-distance cruising. I went aboard the Shannon 38 SRD at the Newport show, while the powerful fury of Hurricane Ivan ravaged the waterfront city. The weather that Saturday afternoon was truly ghastly and effectively closed the show for several hours. We were seriously afraid of losing the PMM tent on the docks. A good time for a boat ride, however-especially one out to prove a point. Driving the boat at 18 knots in choppy seas with storm-strength winds churning the waves into a frothy maelstrom, I could not believe the way this boat handled the seas on all points. Slowing to 10 knots, I made runs with following, beam and head seas of nasty proportions, and the motion remained stable and comfortable with no pounding whatsoever, as if the boat wanted me to know it was up to the challenge. Pushing the throttles back up to 18 knots changed nothing except forward progress, and we ran circles around the bay with almost no wake, while an ocean tug headed out to sea, salt water spraying over the top of the 90-foot workboat. The hull shape becomes active above 6 knots, the water flow interacting with the hull, with its changing underwater surfaces, as if the water is holding onto the hull, refusing to let go. I commented that it felt like a horizontal ice auger pulled along the surface of the water, and Schulz just smiled. I got it. Later, back at the mooring, we were chatting some about the boat when the wake of a passing launch caused area boats to roll gently as it passed through Newport Harbor. The 38 SRD went through one roll evolution as the wake passed by, then stopped dead. Despite its express cruiser, retro-style looks, the Shannon 38 SRD is proof of the SRD concept, and is one terrific seaboat. And as it draws only 24 inches, it is still beachable when you&apos;re not out conquering hurricane seas. Each boat is custom tailored to owner needs; there are several accommodation plans and deck layouts to fit almost any requirements. But Shannon Yachts builds each 38-footer with a composite foam core for a high strength-to-weight ratio, and a completed 38 SRD displaces just 13,500 lbs. And Shannon characteristics for safety are evident, with wide side decks and a secure cockpit. Every Shannon yacht, sail or power, is first and foremost a safe boat. I spent the night aboard the second boat in Florida, and it was a very pleasant experience. The forward stateroom has a traditional V-berth and storage for extended cruising. Just aft of that cabin is a comfortable dinette on the port side, with a second cabin opposite with a clever, sliding pocket door that really opens up the space when no one needs the privacy of that berthing area. The galley is complete with all necessary essentials and appears to have more than enough storage for provisions and cooking equipment. A large head is opposite the galley and includes a separate shower. Overall, the boat works for its intended purpose. The first 38 SRD has twin Yanmar engines and conventional propellers. The second boat has a single Yanmar and also a conventional drive. The third boat, however, is built with a single engine and a surface-piercing propeller. Normally associated with high-speed racing boats, surface-piercing propellers are 20/30 percent more efficient than traditional propeller drives. With parasitic drag significantly reduced by having no appendages in the water, such drives also allow larger-diameter propellers and avoid cavitation by aerating the blades. Schulz is experimenting with these exotic drives to see if any of that efficiency can be achieved at slower speeds in an SRD hull, which he feels is well suited for such propulsion drives. The special propeller is located in a prop tunnel inside the concave stern, and the air in the space is energized by exhaust gases and air forced in from baffled vents to "turbocharge" the air hitting the top half of the propeller, which remains out of the water at speed. Sea trials will prove it one way or the other. More efficiency means less horsepower, which equates to less fuel and a longer range. That is the goal at Shannon Yachts for their new power passagemaker. The 53 SRD is the next boat Shannon Yachts will build, using the benefits of the SRD hull form for a long-distance cruising boat. With an estimated range of over 2500 miles at 12 knots and 1000 gallons of fuel, the boat will have the legs to cross any ocean. And its 3-foot shoal draft makes it wonderfully suited for the shallow-water cruising at the other end of the passage. The 53 SRD will be built on a custom basis, with a wide range of layouts and system choices. Initial renderings show a pilothouse and flybridge, a covered aft cockpit, an owner&apos;s stateroom amidship with guest cabin forward, and three heads in the boat. The low profile of the boat means bridge clearance will be about 16 feet. If the 53 SRD performs as well as its smaller sistership, I predict this new passagemaker will be a hit. And without additional complexity so often found on larger trawler yachts, the maintenance of such a boat will ease ownership duties. It&apos;s all about the concept of "less is more." "If I can&apos;t use sails, because the market is against it," Walt said, "I&apos;m exploring another direction with the SRD." The 38 SRD and the larger 53-footer have become personal efforts for a custom yacht builder exploring uncharted waters, quite literally. We salute Shannon Yachts for pushing the envelope, and we wish them success. We&apos;ll stay tuned to its progress. But if you want to experience the future now, I suggest going for a ride on the Shannon 38 SRD. It sure convinced me. Live long and prosper.